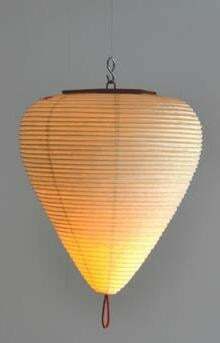 A quirky modern twist on the traditional hand made washi rice paper folding lantern, (chochin). Designed by Mic Itaya, leading multi faceted designer. They seem to be smiling gently as they communicate the beauty of light itself. It uses LEDs. The LED light can flicker like a candle. The surface is semi waterproof. This design can sit on a surface, or be hung up. This lantern is made by a seventh generation Chochin maker in the Mito area. AC-DC lead caters for 110 volts to 240 volts. It has a Category "A" plug, (2 straight flat pins). Countries using other plugs can just use a plug adaptor to suit there country.